This week we offer an assortment of Weibo items for your thoughts: the mysterious but all-powerful Above, China’s new land reform, China’s AIDS exiles, journalists as propaganda workers, free turnips, and more. Click on date below item for link to the original. 黎学文在北京/Li Xuewen in Beijing/(Writer, publication planner)/:【The invisible Above】There is an absurd black hole in [China’s] current power operation: In each of the wrongful convictions, there are enforcers but no one is in charge. The enforcers say, this is the decision of the Above. But no one knows who is the Above and who you can take legal action against. As the source of evil, the Above is shrouded in a fog. There are evil doers but no one can be held accountable for the wrongdoings. As a result, the wrongful cases can’t be redressed, and power continues to ravish. Morality is collapsing all but inevitably. 何光伟/He Weiguang/(Journalist with 《时代周报》or Time-Weekly)/: The land reform that introduces shareholding system is a big bomb. Throughout the history, rulers were always very cautious about land reform. Wang Shiyuan (王世元), deputy minister of the Ministry of Land and Resources said the other day that the Ministry is encouraging places with the right conditions to carry out rural land reform that introduces shareholding system, making it a norm to list land in the stock market. The land circulation policy proposed earlier by the government now has entered the stage of implementation. This is tantamount to turning on green lights for land grab by powerful groups. It will inevitably lead to the emergence of large-scale migrant population, laying down a gigantic bomb for social stability. 曾金燕/zengjinyan/(wife of Chinese activist Hu Jia) /: Today is World Aids Day. Dr. Wang Shuping, who first discovered blood transfusions were the source of HIV spread in China, was forced to leave China. Dr. Gao Yaojie, who fought hard for the treatment and prevention of AIDS and who is in her 80s now, also had to leave China. Then Wan Yanhai, the founder of “Ai Zhi Action Project” (“爱知行动项目”, later, [the Beijing-based NGO] Ai Zhi Xing Institute, 爱知行研究所), and his family were forced to exile too. Finally, Hu Jia, former acting director of Ai Zhi Xing Institute and the founder of Ai Yuan, was imprisoned and still hasn’t gained complete freedom. To this day, no one has been held accountable for the AIDS epidemic through blood transfusions. Left: Dr. Gao Yaojie. Right: The family portrayed in the documentary "To live is better than to die." The mother had died of AIDS, the father and the two younger girls were all HIV-infected. LaotaitaiXP/(Netizen)/: Watching Chinese ambassador handing over school buses to Macedonia, I was so full of envy. As someone from Gansu, I look forward to Gansu establishing diplomatic relationship with China as soon as possible. 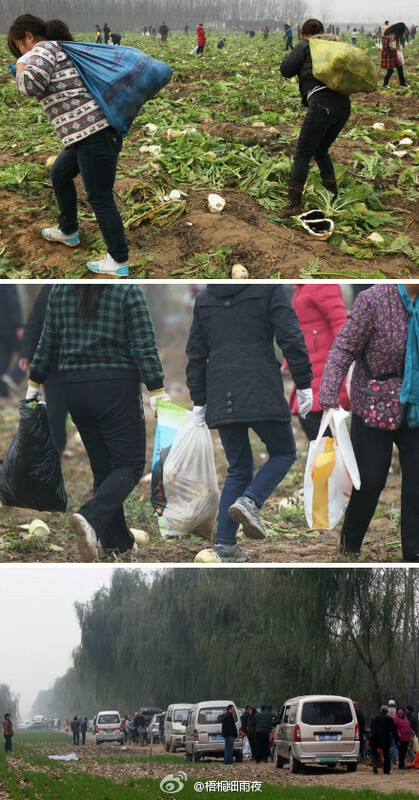 农享网官方微博/Agricultural Information Sharing Network’s official Weibo/: …Farmer Han Gang [in Hua County, Henan province] grew 200,000 kilograms turnips but couldn’t sell them for any price. So he decided to give them away to the public. 30,000 people showed up to pull the turnips. They pulled away all the turnips, but also 10,000 kilo of sweet potatoes…. I am making a dark stew of pig feet. Using beer and no water at all. I pour a glass of Niu Er. Waiting for the stew to cook. By T in Uncategorized on December 3, 2011 . LaotaitaiXP had me laughing out loud. I am glad you had fun, Lorin, but I am sure you felt the weight of sadness too right beneath the surface. I like items like this one: In so few words, it says so much. To clarify, laughing out loud in appreciation of the incisive irony. Maybe I should thank your translation for that. Since I translated the item by “Walking on the blade 21”, there have been more than 4,300 reposts and 1,000 plus comments. And there are other posts spreading the same speech by the new CCTV head. Even though, in China, people know journalists working for CCTV, People’s Daily, and the like are not really journalists, still, it jolts your sensibility somewhat to see such blatantness. To me, the blatantness indicates a contempt that has always been a defining feature of the party’s character. The speech isn’t new; but only a medium such as Weibo can take it to a truly wide and interactive audience. It is a force they have to reckon with. So little is known about the real china … thanks for sharing. People’s of China advised of western democracy / freedom..
having learning western democracy in truth of no true value. being there no certain authority in control /in changing times. they having won that challenge without their raising an sweat. the spirit departing unto after ones death of their mortal frame. chinese govts. / Is not one prepare for peace / but that of war. in bowing to their enemy such only do willingly to the Almighty. Thus China & other nations / now preparing for the final battle. Fascinating. I can’t wait for the final battle with the Almighty. Or was that for the Almighty? Lorin Yochim // The Answer To Your Question is Both. The first battle be one’s stupidity /against the Almighty. where knowing Spiritual Self / one’s Final Battle’s won. experience / answering in clarity in knowing the true self. it’s ability via heart brain in bringing one’s enlighenment. Lorin / Your Welcome / It’s a Vocation Of The Heart.